With the unpredictable weather fall brings, it’s likely your furnace is already in use. But before the bitter cold sets in, is your furnace working at peak performance? If not, it may be time for some repairs — or maybe even a new furnace. It can be difficult to recognize whether a furnace is in need of some minor repairs or if it’s time to replace it entirely. Here are 6 factors to consider about whether you should repair or replace your furnace. The age of your system is the first factor to consider. 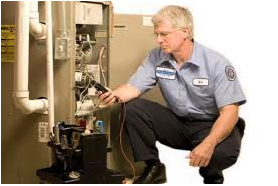 The average lifespan of a furnace is 15-20 years; after that the system will start to fail more often. If your furnace is 10 years old or less, repairs should be effective. If it has reached 12 years or more, it’s time to consider replacement. If your furnace is more than 10 years old but having consistent issues, consult an expert. If your energy bills are increasing without an increase in usage, your furnace efficiency is definitely going down. Your furnace may be working twice as hard to create the same amount of heat. This is the first sign that it’s time to call in the experts and find out whether your furnace has seen better days. Find out from your HVAC expert whether simply updating the thermostat or your ductwork will solve the problem, or if it’s time to retire your furnace for a new one. If heat isn’t being distributed evenly, it tends to pertain to a duct issue in your home. If your home doesn’t heat up evenly, your home won’t be comfortable and your furnace will have to work twice as hard. This is a good time to call a repairman and determine whether the issue is your duct system or if a furnace replacement is necessary. Older furnaces are usually working harder, causing them to make rattling, popping, or banging noises. This can also result in a lack of ability for your furnace to properly moisturize the air, resulting in dry or stale air quality in your home. These are good indications that your heating system needs replacing. A natural gas burning will produce a blue flame with a light shade of yellow at the top. If the flame is yellow, it’s an indication that the fuel combustion is incomplete and your furnace could be producing carbon monoxide. In this instance, call an expert right away. A minor repair could be in order; however, it could be an indication that your furnace has worn out. If you are looking to prevent several costly repairs, a proper inspection of your heating system will help determine what repairs, if any, are needed to keep your furnace working its best this winter. The last thing you want is to find out your furnace needs substantial repairs or replacement when we’ve already hit sub zero temperatures. Contact the experts at Sedgwick today and keep your home warm and cozy this season!